If you’re sick of hearing people shout “Alexa!” everywhere you go, it’s probably best you steer clear of London Fashion Week. Not because the photographers and journalists are spending the weekend barking at their smart speakers, but because of a certain newcomer to this season’s schedule. 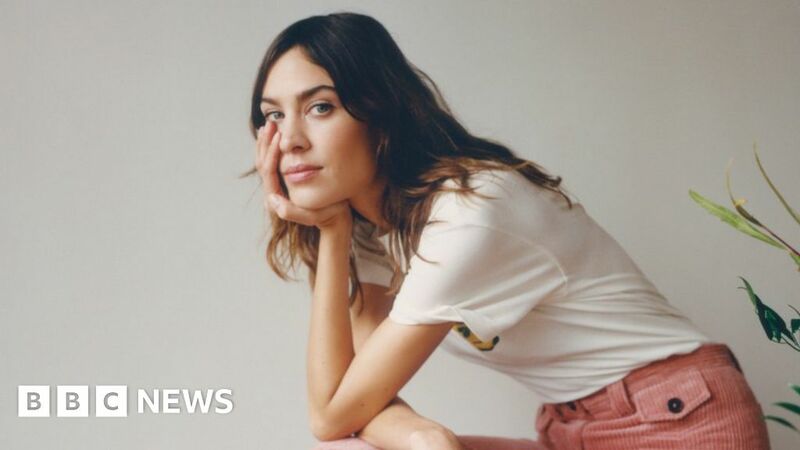 Appearing alongside the likes of Jasper Conran, Victoria Beckham, Burberry and Pam Hogg is former TV presenter and model Alexa Chung. She may have been a familiar face in fashion for more than a decade, but Alexa’s LFW debut this weekend comes just one year after launching her eponymous clothing brand. Of course, unleashing an entire collection of clothes you’ve designed as part of such a starry and prestigious line-up would understandably be a daunting prospect for anyone. But “imposter syndrome”, as she refers to it, is something the Alexa is no stranger to. “It’s not exclusive to fashion, I’ve felt it with everything I’ve done,” the 34-year-old tells BBC News. “Writing for Vogue, that’s a huge imposter syndrome. Television, every day before we went live, I’d be like, ‘am I equipped to do this? I don’t know’. Feeling inadequate or as if you’re about to be “found out” at work is a something a surprisingly large number of us can relate to. Jobs which are high-profile or high-pressure often come with such a feeling. The author Maya Angelou once said she feared being uncovered as a fraud despite, at that point, having a Pulitzer Prize and 11 successful books to her name. But, Alexa reasons: “I think it’s a good thing to be aware of or to feel about yourself, because it allows you to still be open to learning, it means you’re more curious about other people and how their journeys have happened. Alexa has now returned to the UK and is living in London after several years in New York. “What’s interesting to me is there’s this place where people from literally all around the world in one hallway are all expressing themselves, be it in the most casual form or whatever. “And it’s where people are the most vulnerable, because you’re flying either long haul or short haul but feeling really gross, so how does one’s personal style leak out of them when they’re in an environment that’s deeply unglamorous? The creative process involved Alexa looking back at figures from the 1960s and 70s – an era her own style is heavily influenced by. She cites Bianca Jagger and Pattie Boyd as key figures – both of whom were often photographed on airplanes or in airports. “Our starting point was looking at those glamorous images of yesteryear when flying was a more unique experience,” Alexa explains. Such photos, taken at the height of the Beatles and Rolling Stones’ fame, are a far cry from the accessible and mainstream budget airliners of today. Low-cost carriers such as Ryanair and Easyjet were introduced in the 1990s and put foreign holidays within financial reach of an entire generation. Their huge success was attributed to the favourable economy at the time and deregulation within Europe allowing free movement. This may be the first time Alexa’s own designs are taking centre stage, but she has collaborated extensively with other fashion brands in the past – whether as a model, ambassador, designer or curator. She says she was “lulled into a false sense of security”, by some of the previous projects she’s worked on, “which is why I had the gumption to even start this company”. “I was like ‘it’s easy’, and then I started doing it myself and I was like: ‘Oh, okay, there are lots of backstage elves that were really helping make that really slick and I obviously wasn’t privy to the hellmare that was creating stuff. “I think I had an essence of it and I was able to see the tip of the iceberg in terms of looking at marketing or designing swing tags or all of the nitty gritty, but I was still only going about 20% deep. Alexa has never been short of work – or popularity – a position which, if in the same situation, many of us could get used to. With that in mind, and given the all-consuming nature of launching a business, it raises the question of why she chose to embark on her own clothing venture at all. “The reality of getting older was, I desired a more grown-up job, basically,” she says. If her current upwards trajectory continues, it’s unlikely Alexa will be feeling like an imposter for much longer.